Britain’s finest poets write about the great events of our lives. 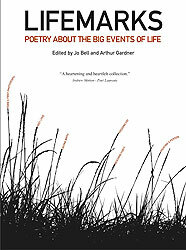 A birthday, a bereavement, a love affair or sunset; Ian Duhig, Julia Copus, Paul Farley and others mark these moments in a remarkable and life-affirming anthology. ‘a heartening and heartfelt collection’ Andrew Motion. Proceeds go entirely to the Motor Neurone Disease Association. All poems have been freely donated and the proceeds go entirely to the Motor Neurone Disease Association. This beautiful book published by Cub is £6.99, which means a donation of £6.99 for each copy you buy – and a fine book for yourself or a fellow poetry lover.